I read this book a couple of weeks back for a module I’m taking now called “Obesity Perspectives and Prescriptions”. I gotta say, this book was quite a shocker. I learnt so much about obesity and health that contradicted my preconceived ideas, assumptions and stereotypes about obesity. I highly recommend this book not just for people who want to understand their struggles with weight, but also for everyone involved in the health and weight loss industry to understand that sometimes, focusing on the sole goal of weight loss may not be the most ideal choice. Instead, increasing one’s fitness level is far superior for health in terms of reducing one’s risk of all-cause mortality. Below, I detail an answer to an exam question from this module which simultaneously serves as a book review. Q: Discuss the concept of the obesity paradox. Define it, give examples and explain what it means in terms of potential treatment of obesity and chronic disease. 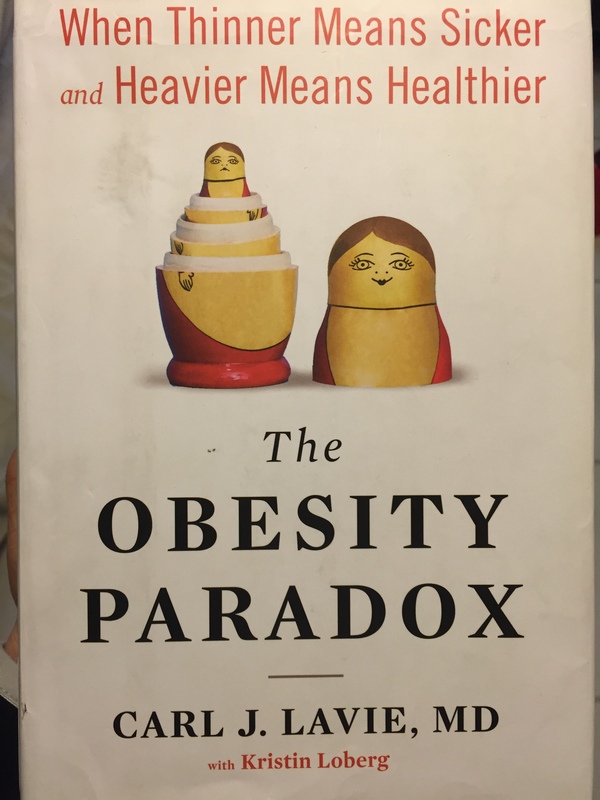 A: It is hard to define the obesity paradox as a singular phenomenon because in truth, there are multiple obesity paradoxes to define thus for the purpose of this question, I will mainly be referring to the review article by McAuley and Blair (2011) titled “Obesity Paradoxes”. The first and most commonly referred to paradox of obesity is the “Classic Obesity Paradox”. Basically, there is a general view that obesity is detrimental to health and thus people with obesity are not expected to have better survival rates if they have been diagnosed with diseases that are life-threatening. However in reality, the opposite is the case whereby people who are obese fare better than their thinner counterparts. Because this paradox has been most commonly reported in cardiovascular disease (CVD) patient groups, McAuley and Blair confined their review of the literature to this segment of the population. They reviewed 27 studies, of which only 15 met the criteria of more than 2 years of follow up and a sample size beyond 1000 patients. This accumulated to a total of 343, 922 patients with CVD where the obesity paradox was observed. The second paradox of obesity can be described as the “Absence of Pre-Obesity as a risk factor”. Simply put, being in the Body Mass Index (BMI) category of pre-obesity (defined as having a BMI within the range of more than 25 but less than 30) is negatively associated with increased risk of CVD and all-cause mortality. In fact, a meta-analysis done by McGee (2005) on 26 studies even found a slight protective effect of being in this category of BMI. The third obesity paradox is that “fat but fit people are not at risk”. The general opinion is that obesity has a strong correlation with mortality risk, no matter the level of fitness of the individual. However, there is ample data to prove that obese but physically fit individuals do not have any higher risk for CVD and all-cause mortality when compared to individuals who are of normal weight and fit. Additionally, these fat but fit individuals have considerably lower mortality risk than those who are of normal weight but physically unfit. For example, a study by McAugel and colleagues (2009) examined 13,155 men with hypertension and found that fitness was strongly inversely related to mortality. These fit and hypertensive obese men had no more risk of CVD or all-cause mortality than the fit normal weight men. Lastly, the fourth and final paradox is that of “the prevalence of healthy obesity”. This is the phenomenon of a large number of obese individuals who have minimal cardio-metabolic risk – absence of risk factors such as low HDL, insulin resistance, high triglycerides, high blood pressure, abnormal fasting glucose/diabetes and high C-reactive protein. A review done by Wildman et al. (2008) found that obese individuals defined as healthy (having no more than 1 of the above mentioned factors) comprised 29% of obese men and 35% of obese women. The implications of these obesity paradoxes on the potential treatment of obesity and chronic disease are profound. It implies a shift from treatment focused on weight loss to one which focuses on increasing physical fitness levels since the evidence suggests that being fit, no matter the weight category, is significantly more beneficial to health and reduction in all-cause mortality than being unfit. Hopefully there could be an accompanying social acceptance of “health-at-every-size” and less weight discrimination in the public too. Next Post Study Guide: Improve your productivity, Improve your grades! Thanks Tifness 🙂 Keep up the great work!